Can the new Canon 5D Mk III beat its older brother? The Canon EOS 5D Mark II was announced way back in September 2008. Its replacement, the Canon EOS 5D Mark III, announced on 2 March, features a 22-megapixel full-frame sensor. The EOS 5D Mark II has a 21MP full-frame sensor, so Canon has added one million pixels to the new DSLR. Is that it? What's Canon been doing all this time? Quite a lot, as it happens. The resolution, and that tiny 1MP increase, is the least significant aspect of the EOS 5D Mark III's improvements. Pixel counts continue to make headlines, but most professionals would probably agree that 20MP is enough. The 36MP Nikon D800 might have caused a bit of a storm, but for many practical, professional purposes, the Canon 5D Mark II's resolution was not the problem. The Canon EOS 5D Mark II has a maximum sensitivity of ISO 6400, expandable to ISO 25600. The sensor in the Canon EOS 5D Mark III is all-new, though, and has an increased ISO range. The Mark 3 camera has a maximum sensitivity setting of ISO 25600, expandable right up to ISO 102400. That's a whole two stops more, both in the normal and expanded ISO range. Few would fault the image quality of the Canon EOS 5D Mark II, but the Canon EOS 5D Mark III goes further, not by increasing the number of pixels, but by including a number of features designed to improve sharpness, reduce lens aberrations and handle extra high contrast lighting. Not all lenses live up to the legendary reputation of Canon's L-series glassware such as the Canon EF 100mm F2.8 L Macro IS USM lens, but the EOS 5D Mark III brings in-camera correction for peripheral illumination (vignetting, or corner shading, in other words) and both lateral and axial chromatic aberration. And the Digital Photo Professional 3.1.1 software bundled with the MK 3 camera incorporates a new Digital Lens Optimizer designed to correct a range of aberrations and counteract the effect of the sensor's low pass filter, delivering new, higher levels of resolution. The Canon EOS 5D Mark III also incorporates an HDR mode that combines three separate exposures and applies one of five different tone maps to suit the conditions you're shooting in and the effect you're looking for. The Canon EOS 5D Mark II might have been ahead of its time, but its autofocus system wasn't. Its simple 9-point AF system, plus 6 Assist AF points, was adequate, but only just. The Canon EOS 5D Mark III, however, uses the same advanced 61-point wide-area autofocus system as the Canon EOS-1DX. This incorporates 41 cross-type AF sensors and five dual cross-type sensors, together with the autofocus presets introduced with the Canon EOS-1DX. These quickly set the camera up for optimum AF performance in six key autofocus situations, or 'Cases'. And Canon's new iTR (Intelligent Tracking and Recognition) system uses colour information and face recognition to improve the reliability and speed of its focus tracking. The Canon EOS 5D Mark II offers 35-zone Evaluative, Centre-weighted, Partial and Spot metering systems. The Canon EOS 5D Mark III's Evaluative mode uses a new 63 zone dual-layer sensor that responds more reliably to different colours and forms part of Canon's latest iFCL (Focus, Color, Luminance) exposure system, first seen in the Canon EOS 7D, which also uses focus point information to arrive at the correct exposure. This is a much more sophisticated system than the Canon EOS 5D Mark II's, although exposure metering is a skill that also relies heavily on the photographer's familiarity with the camera's metering system, so photographers who've learned to get good results with the Canon 5D Mark II may need to relearn the exposure system in the Mark III. The Partial and Spot metering modes on the 5D Mark III are more precise than the old camera's, too. Partial mode measures 6.2% of the scene (8 per cent in the 5D Mark II), while spot mode measures 1.5% (3.5% in the 5D Mark II). Speed was not one of the Canon EOS 5D Mark II's strong points, with a maximum continuous shooting speed of 3.9fps and a buffer capacity of 310 JPEGs (with a UDMA card) and 13 raw files. The 5D Mark III beats that easily, thanks to Canon's latest DIGIC 5+ processor, shooting at 6fps for 16270 JPEGs - indefinitely, in other words - although if you're shooting raw files the maximum capacity of 18 shots provides a smaller advantage over the 5D Mark II than many might be expecting. In any event, the combination of higher frame rates, greater capacity and much faster autofocus mean the Canon EOS 5D Mark III is much better suited to fast action photography than the Canon EOS 5D Mark II ever was. The Canon EOS 5D Mark II has already carved out a reputation as the best DSLR movie camera available, and because it already shoots video in Full HD, the Canon EOS 5D Mark III might not offer any obvious advantage. However, Canon claims that the combination of the new sensor and DIGIC 5+ processor "virtually eradicates" moire, false colour and other artefacts. SMPTE timecode support makes the Canon EOS 5D Mark III easier to use in professional, multi-camera shooting situations. And professional sound quality will be much easier to achieve, thanks to an external headphone socket - an essential feature for video pros. It's also possible to trim movie clips in the camera. The price of these cameras could prove an issue, possibly even a deciding one. The Canon EOS 5D Mark III will go on sale for £3,000 in the UK or $3,500 in the US for the body only, whereas the Canon EOS 5D Mark II is currently on sale for just £1,700, or $2,200. Even at launch, the 5D Mark II was considerably cheaper, at £2,300, or $3,000. At first glance, the Canon EOS 5D Mark III might seem like a pretty modest upgrade of the old Canon EOS 5D Mark II. But it boasts a number of very important improvements, including the autofocus and metering systems, enhanced filming capabilities, high ISO capability and continuous shooting speed. These might not grab headlines in the same way as a big jump in pixels, but they perfectly address the Canon EOS 5D Mark II's deficiencies without trying to fix what didn't need fixing. 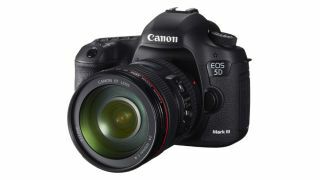 However, the Canon EOS 5D Mark III isn't just more expensive, it's in danger of moving into a different price bracket. What made the Canon EOS 5D Mark II so appealing was that it was an affordable step into professional-quality full-frame photography for amateurs. The Canon EOS 5D Mark III, however, may be a step too far.